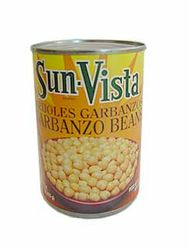 Canned garbanzo beans by Sun Vista. Garbanzo beans, are also known as chikpeas, a unique spherical shape with the hint of a tail, purportedly resembling a ram�s head. Chickpeas, which grow on a plant native to the Middle East, are popular throughout India, North Africa, Spain, Mexico and southern France. They are gaining in popularity in the United States, thanks to increased interest in ethnic cuisine, and can often be found on salads to boost protein levels. Garbanzo or Chickpea (Cicer arietinum L.) is an ancient crop that has been grown in India, the Middle East and parts of Africa for many years. Much of the world's chickpea supply comes from India. Most of the garbanzo acreage in the United States is in California, eastern Washington, parts of Idaho and Montana are also now growing this crop successfully. Also Mexico and Spain are suppliers of Garbanzo beans. Garbanzo or Chickpea is consumed as a dry pulse crop or as a green vegetable with the former use being most common. Seeds average about 20% protein, 5% fat and 55% carbohydrate. Seeds are sold in markets dry or canned. Most common uses are in soups, vegetable combinations, or as a component of fresh salads in restaurant salad bars. Garbanzo is consider a good source of protein. El garbanzo es nativo de las costas mediterr�neas, aunque el productor mas importante es la India. Las semillas tienen una forma esf�rica, debido al grosor de los dos cotiledones que la forman. Contienen gran cantidad de proteinas, hidratos de carbono, fosfatos, calcio y vitaminas del grupo B, aunque su valor nutritivo, como el de todas las leguminosas, decrece con el tiempo. Se consumen preparados de formas muy diversas en especial en Espa�a, donde constituyen el ingrediente principal de muchos platos t�picos como el cocido y el potaje en todas sus variedades. Los garbanzos llegaron del Asia Occidental. Todos los pueblos que van desde el Mediterr�neo hasta la India mostraron afici�n por ellos, y de ello sigue dando f� la gastronom�a de estas tierras. Seg�n un libro del arte amatorio hind�, eran afrodis�acos y su consumo habitual favorec�a la energ�a amorosa. Los garbanzos nos ayudan a liberar colesterol, ademas producen serotonina: la hormona de la felicidad. Aprende mas sobre las propiedades del garbanzo.